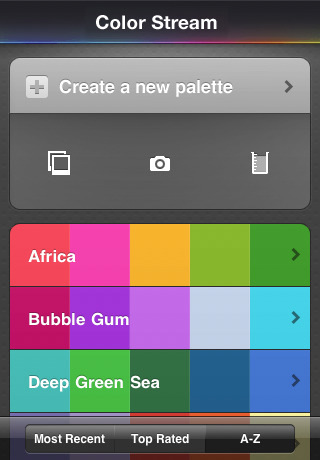 Color Stream is an iPhone app for generating color palettes. You can use the app to create new color palettes from photos you take on your iPhone, or using existing photos you have on your device. Color Stream also allows you to custom create and edit color palettes from scratch using the popular built-in color schemes. When you open the Color Stream app, you have 3 options. Tap the color palette icon to create a new palette manually. Choose a pattern from the list including: Monochromatic, Analogous, Complementary, Split Complementary, and Triadic. Pick the right color from the sliders, and you can swap between RGP or CMYK. Color Stream updates the 5 colors on the bottom of the screen in real time as you update the sliders to show you your final result. When you’re done, tap on the save button to store it. Tap the i button and you can give it a name, star rating, save it as a photo to your Camera Roll, send it via email to someone, or tap the browser icon to view color matched photos at ideeinc.com for your palette. Your list of palettes can be sorted by name, rating or creation date. The best part about the Color Stream app is the automatic palette generation using photos. As a designer creating a color scheme from actual photos can be very powerful way of adding relevancy to your work. Color Stream makes this a breeze. Just snap a photo, then move and scale it to where your desired colors are located, and tap use. Color Stream pulls 5 colors out of the photo and comes up with a new palette for you. From here you can then tap on any color, tap anywhere on the photo, and the app changes that color to match to the color you tapped on. This is great for those who want even more control over the process. 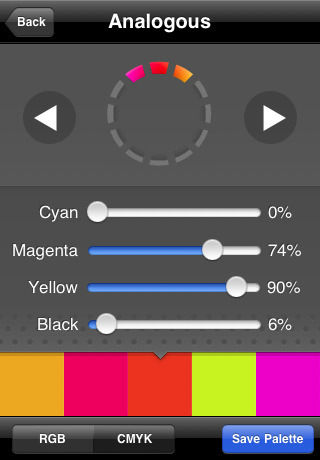 Overal, Color Stream is a sold app for anyone interested in creating color palettes from a mobile device. Great for both experimentation and production level use. A little pricey but well worth the features provided. AppSafari review of Color Stream was written by Joe Seifi on December 26th, 2010 and categorized under App Store, Developers, Photos, Productivity, Utilities. Page viewed 4501 times, 1 so far today. Need help on using these apps? Please read the Help Page.